Whether you’re looking to enjoy a recital, book a practice space, or learn an instrument – at Nottingham Trent University (NTU), you can count on great facilities, expert teaching, and plenty of encouragement! 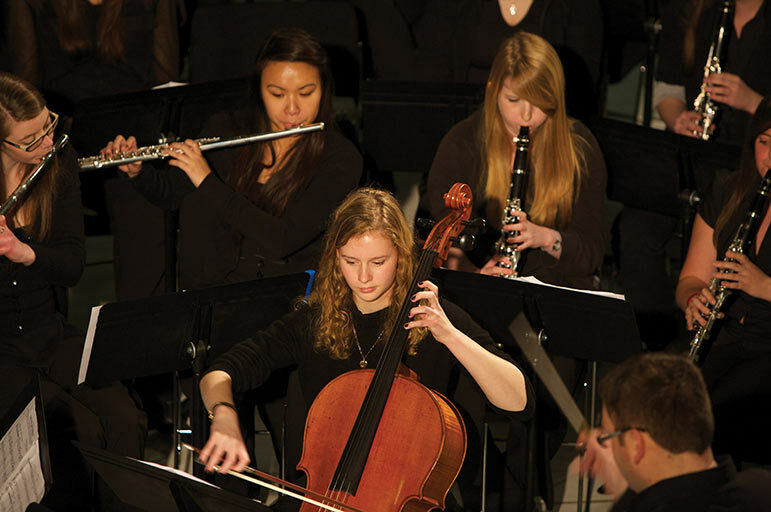 Hire instruments, take lessons, and even join one of our exciting ensembles – with choirs, a concert band and orchestra, and numerous student-led societies, there’s lots of exciting opportunities open to you. a great selection of string, brass, wind, and percussion instruments, ranging from Heintzman and Yamaha pianos, to acoustic and digital drum kits. NTU Music has been great throughout my first year of University. I've been able to continue my music and develop as a musician through individual lessons and ensembles, which I've really enjoyed. I've made lots of friends and taken part in a variety of performances, increasing my confidence and fulfilment as a musician. Whether you're a beginner or an expert, get involved! Whatever your abilities and experience, NTU is a great place to develop yourself as a musician. You can learn new skills, meet new people, and build your confidence. So don’t be shy – come and introduce yourself! Our Music Centre is located on Goldsmith Street, up the path in between the Premier Inn and the NTU Taste Cafe, opposite the Boots Library.